Sleek are one of my favourite budget beauty brands, and their lip products are some of the best around. Their 4 Lip Palette in Mardi Gras contains four amazingly bright lip shades – my personal favourite is the purple! It’s only £8.99 too which is a complete bargain! Too Faced’s Melted Lipsticks have to be one of my favourite ever lipstick formulas. With super high pigmentation these lipsticks appear perfectly opaque, and have the added bonus of not drying out the lips – and they also don’t transfer and last for literally hours on end. Too Faced now have quite a large shade range but I love Melted Ruby especially for a gorgeous perfect red Valentine’s lip. A Heartbreaker mini makeup bag with a bright pink glossy finish. A Smart Lipstick of your choice. This is a rich and nourishing lipstick with an instant and ultra silky glide. I have 912 which is a lovely intense pink shade. A Smart Lip Pencil of your choice. This is a creamy and blendable lip pencil with an intense, high-coverage line. I have 706 which is the perfect partner for the lipstick! I do love a matte lip, especially in bright colours, so at only £6.00 these NYX lippies will do the job without breaking the bank. Bloody Mary is a bright slightly pink toned red which will easily suit any skin tone, and Pure Red is a super bright slightly orange toned red, which is great for a more daring look! And of course, this wouldn’t be a lipstick post with out at least one MAC would it!? Impassioned is a lovely fuchsia shade with a super opaque and creamy Amplified finish that doesn’t make lips dry or uncomfortable in any way. I love this colour and could easily wear this lipstick every day. 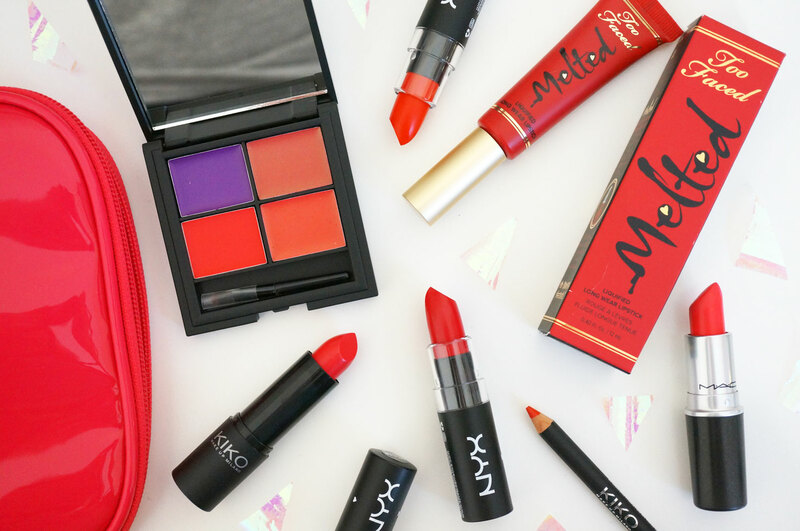 Are you a fan of bright lipstick? I’d love to hear your favourites! Previous Post Top Secret Project Announcement! I can’t wear reds sadly as they don’t suit me.